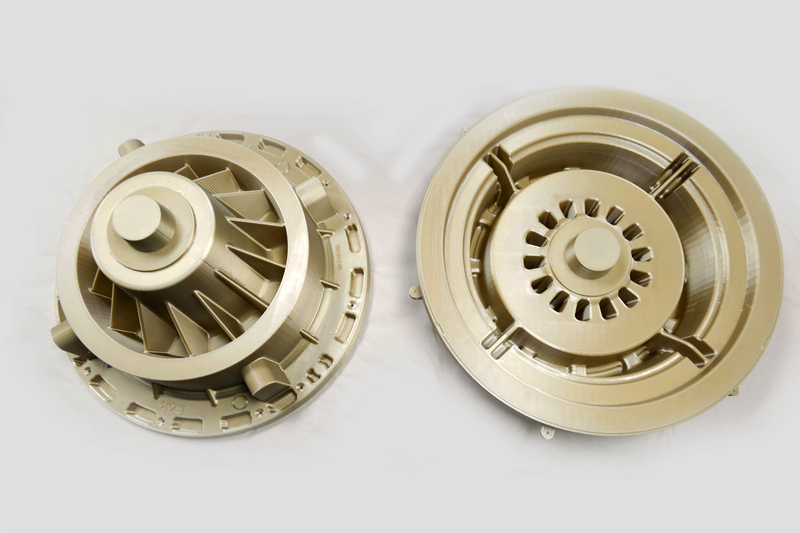 Using 3-D printing, ORNL researchers rapidly prototyped a complex gearbox pattern and created sand molds to make no-waste aluminum parts for industry partner, Emrgy Hydro. March 2, 2017 – Oak Ridge National Laboratory has successfully developed and tested a novel sand casting technique to quickly design complex patterns to fabricate components for industry partner Emrgy Hydro, makers of hydropower devices designed to generate electricity from slow or shallow water flows. Using 3-D printing, the collaborative research team rapidly prototyped a complex gearbox pattern and created molds to make no-waste aluminum parts for the Emrgy system. “Leveraging ORNL’s expertise in additive manufacturing, we’re able to test and make adjustments quickly, which reduces our cost and lead time in designing and making components,” Emily Morris, Emrgy founder and chief executive officer, said. “This can be critical to the success of fabricating a new energy system.” The process was co-developed at Atlanta-based Emrgy Hydro, the DOE Manufacturing Demonstration Facility at ORNL and Wisconsin-based Eck Industries.